The Pittsburgh Penguins hosted the Colorado Avalanche tonight, with the Pens enjoying their fourth consecutive game at home. Lineup changes for the Penguins included Sidney Crosby returning to the ice after missing time with the mumps, Beau Bennett missing his second straight game (mumps), and after numerous call-ups, Scott Harrington made his NHL debut on the blue line replacing the injured Robert Bortuzzo. This was the first of two games between Pittsburgh and Colorado. Last year, the teams split wins, with the Avalanche shutting out the Penguins in a mid-October tilt while the Penguins won in a shootout right before the playoffs started in April. The Penguins were forced to kill two early Avalanche power-plays after Simon Despres and Steve Downie went off for interference and elbowing, respectively. Pittsburgh's penalty killers were successful in neutralizing Colorado's puck movement, and Fleury was forced to make only two difficult saves while shorthanded. Colorado dictated the early pace of the game, with the Pens unable to generate much momentum through the neutral zone. Pittsburgh also had difficulty establishing an offensive cycle in the first half of the period, but following a Brad Stuart call for tripping Malkin, the Pens were able to sustain momentum from the man advantage (even though they failed to score on the power-play). Blake Comeau had the Penguins' best scoring chance on a 2-on-0 up close to the Avalanche goalie Calvin Pickard, but Comeau opted to try a phone booth pass that skittered harmlessly away. The Penguins finished the first stanza ahead 8-7 in shots on goal, with Malkin being Pittsburgh's best player on the ice. The Penguins and Avalanche opened the second period tied at 0-0, but Pittsburgh wasted little time in generating multiple overload situations that resulted in clear shots on net, but Pickard was up to the task each time. Pittsburgh enjoyed their second power-play of the game following a Dennis Everberg boarding call, but once again failed to slip one past Pickard. Following a brief scuffle in the neutral zone, Bobby Farnham and Cody McLeod faced off in an extended fight that saw McLeod ultimately topple Farnham. Both players could be seen laughing about the altercation afterward in the penalty box. Multiple Penguins were hobbled by shots, including Rob Scuderi and Kris Letang, who had an overall physical game that clearly took a toll on his body. Neither team was able to generate much momentum from the donnybrook though, and despite a lot of shots by both teams (31 shots combined), the second period ended with both Marc-Andre Fleury and Calvin Pickard sporting shutouts. The Penguins dominated play in the third period, with Hornqvist being stoned from close in front, and Sidney Crosby had his second primo scoring chance denied on a breakaway. Nathan MacKinnon had Colorado's best scoring chance, pushing a puck into a squared Fleury, and Colorado spent the majority of the period yielding nothing but one-and-done shot opportunities. Following his second quality scoring chance of the period, Patric Hornqvist was hobbled after blocking a shot near his own blue line. With just two minutes left, the Avalanche enjoyed their best bout of sustained pressure, with Marc-Andre Fleury making a critical save off of an unintentional redirect off of Simon Despres in front. Colorado would retrieve the puck but their second shot was easily shrugged off by Fleury and cleared off the glass for a much-needed line change. Despres had a bad turnover with just over 10 seconds left in the third, but Downie recovered and fed the puck around his own boards until regulation expired. The Penguins' 43 shots on goal were Pittsburgh's highest shot total thus far this season. Thirty seconds into OT, Malkin skated down the center of the ice and used Colorado's defensemen as a screen for a good scoring chance. On the ensuing faceoff, Sutter almost converted a missed shot with a wraparound goal to end it, but Pickard got his paddle down to make the save along the post. Blake Comeau had a sustained possession in the offensive zone, and after Evgeni Malkin replaced Brian Rust on the ice, Malkin redirected a Rob Scuderi shot from the point, and Comeau was in place for an easy tap in goal to give the Penguins the 1-0 win. 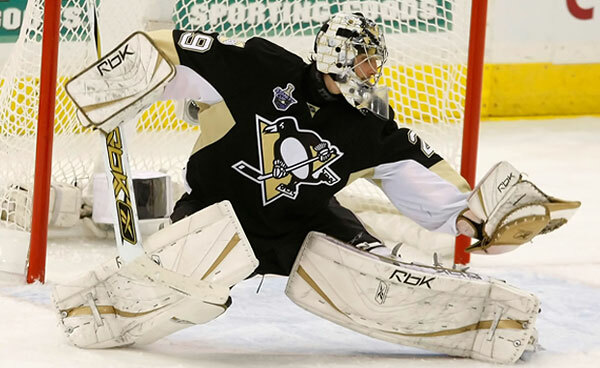 For Marc-Andre Fleury, the shutout was his 6th of the season and 34th of his career.